This classic, Victorian-Style Floor Register with Adjustable Louver infuses period style into any new construction or restoration. 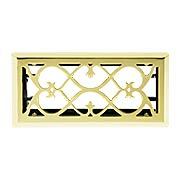 Inspired by Gothic tracery found in stained glass windows, this intricate design turns an ordinary vent into a stylish accent. Made of heavy-duty cast iron, the surface is phosphate treated then lacquered, for rust-resistant, long-lasting wear. 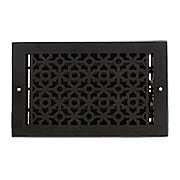 This classic, Victorian Style Cast-Iron Floor Grate for Return-Air Intake or Heat Vents infuses period style into any new construction or restoration. 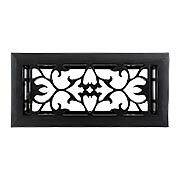 Inspired by Gothic tracery found in stained glass windows, this intricate design turns an ordinary vent into a stylish accent. Made of heavy-duty cast iron, the surface is phosphate treated then lacquered, for rust-resistant, long-lasting wear. With its lively scrollwork this quality floor register transitions beautifully from traditional to contemporary interiors. With four standard sizes and finishes, you'll find the perfect combination for every room in your house. Made of durable and beautiful cast brass, to provide you a lifetime of top-quality performance. A graceful pattern of vines and fleur-de-lis give this stylish European-Style Floor/Wall Register elegant flair. With nine standard sizes and six popular finish options, you can add a touch of vintage charm to every room in your house. The 6" x 10", 6" x 12" and 6" x 14" sizes also come with screws and screw holes for alternate use as wall vents. 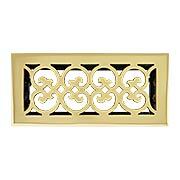 Constructed of durable and economical, plated or enameled steel. The intricate geometric design of our Pasadena registers was inspired by ancient Moroccan tile patterns. Romantic and historic, with a satin black finish, it's the ideal choice for Spanish Revival or Arts & Crafts style homes. The grille is made of cast aluminum, a material valued for its strength and rust resistance (some surface imperfections may be visible). With its lively scrollwork and handsome distressed finish, our premium quality wall register transitions beautifully from traditional to contemporary interiors. 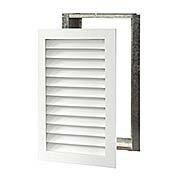 The airy and elegant design is crafted from substantial cast bronze, and equipped with a heavy-duty steel louver. 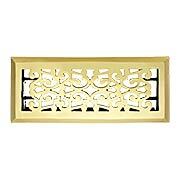 At 1/8" in thickness, this stylish register is built to last a lifetime. The Paint Grade Birch Wood Return Air Grille is a wonderful alternative to the stamped metal standards for wall or ceiling mounting. Made of pre-primed, ready to paint birch wood, each is crafted with tongue-and-groove construction and glued at every joint to prevent warping, bending or breaking. Its patented attachment system allows for simple removal, making it easy to replace the filter or clean the duct - all with no moving or visible hardware. Comes complete with metal sleeve designed to house a 1-inch air filter. Our Stanford Floor Register with Adjustable Damper adds period-perfect looks to new construction and restoration alike. Made of hand-polished, solid brass, this neo-classical design features a fully adjustable damper for optimal airflow. Choose from a host of popular finish options. 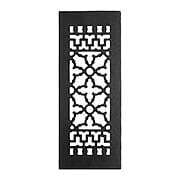 This classic Vine Pattern Floor Register infuses period style into new construction or restoration. 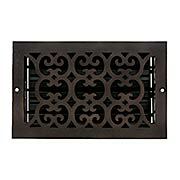 A graceful vine motif gives this European style elegant flair, turning an ordinary vent into a stylish accent. Our modern recreation is cast from solid iron and finished with a durable, matte-black powder coat.